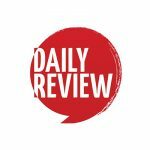 Artist Tom Alberts breaks into the Louvre | Daily Review: Film, stage and music reviews, interviews and more. Melbourne portrait and still life painter Tom Alberts has just concluded a residency at the Louvre in Paris as a copyist. The granting of access to the museum to copy a chosen work of art from the Louvre’s collection is a relatively rare privilege given only to established artists. 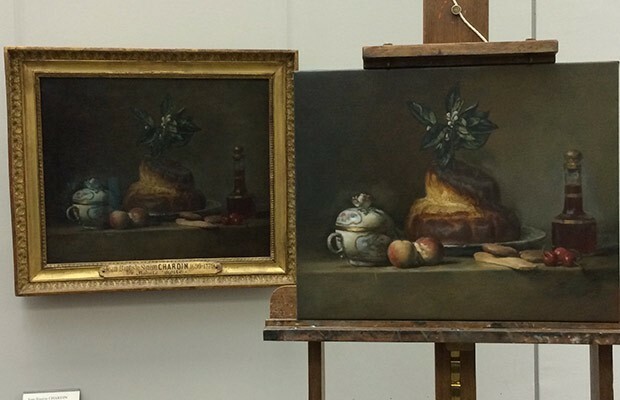 We asked Alberts, winner of the 2013 Rick Amor Self-Portrait Prize, about working in the gallery and his choice of the still life, La Brioche by Jean-Simeon Chardin (1699-1779) painted in 1763. Daily Review also asked him about filming the final scene in Paris of his noir 80-minute feature film The Big Kitty in which scores of prominent Australian artists play every feature, cameo or extra role. Alberts has made every single prop (including 1940s car interiors) and built all the sets for the film (including a nightclub interior). The project has taken him and his wife, artist Lisa Barmby, almost seven years to make with a budget of not much more than $10,000 of their own money. How did your time at the Louvre come about? We were going to spend two months in Paris and Lisa (Barmby) my wife, who is also an artist, reminded me of my long standing dream of doing a copy in the Louvre. I hadn’t really thought about it as I was busy with two huge projects — so it seemed as if there wouldn’t be time to do anything about it. I’m glad I put my mind to it as I’ve always envied the copyists at the Louvre and always wondered if I would get a chance to make a copy. As it turned out there was quite a process — formal letters and so on to be completed. In the end my documents didn’t arrive, and it was over before it had begun, but luckily a friend at the other end delivered them for me. There was also an interview in person when I got to Paris. What did the Louvre authorities require? They wanted the usual CV and images of work and etc. and a letter explaining why I wanted to make the copy. They also wanted to see whether or not I had the necessary technical skills to be able to make the copy. It isn’t a service for students — it’s for painters with experience and skill who are wanting to study the collection. Did you have to “prove” your reputation to them? I could point to my copy of Titian’s Sacred and Profane Love I made at the Galleria Borghese and my copy of Velazquez’s Pope Innocent 10th made at the Galleria Doria Pamphilj in Rome. I could show a lot of painting and teaching experience and an obvious sympathy with the type of painting in the collection. The interview was to figure out if was I ready, capable of some French communication and what sort of a person I was. It wasn’t scary, it was exciting and I even got to touch the easel that Cezanne used when he made a copy in the Louvre! It’s the mascot of the Bureau des Copistes. Had you spent much time at the Louvre before? Yes I always visit the Louvre while in Europe and spent a lot of my time in there. It is an enormous collection and it takes a lot of days just to glance at everything. I usually spend concentrated time with just a few things, to really get to know them and not get too exhausted. What makes the Louvre remarkable? I do think it’s remarkable for the depth and quality of the collection, there is nothing like it in the world. Some of my most favourite artworks are there and every visit is different and has completely different effects upon me. Was this something you always wanted to do? From the first time I saw a copyist at work I wanted to do it, I grasped how important it could be in understanding paint. I’ve always wanted to, just never had enough time in Paris to be able to do it. How did you choose the artist and the artwork you wanted to copy? I chose Chardin immediately because he is an artist that is very important to the development of my painting. I’ve found a lot of subtle and interesting things, a lot of inspiration in his paintings over the years. Secondly I chose his painting La Brioche because I’ve always been fascinated by it and I thought given the amount of time available I might be able to make a go of it. It should be pointed out that one learns in the process — of course you have ideas about how an artist works but there’s always the chance that you’re wrong and you’ll screw it up. What are the rules around copying? Oh, there’s rules regarding all aspects of it, the canvas size, (my painting had to be five centimetres larger or smaller than the original) where the easel is, how you place various materials, lots but it’s mainly about public safety and none of them gave me any trouble at all. Well, one rule was you couldn’t leave your easel except for the toilet so sometimes I would have liked to go for a coffee. How many days or hours did you spent in front of the painting? In my section (French 1700s) one could work four days a week (Monday, Wednesday, Thursday, Saturday) from 9.00 am in the morning till 1.00 pm in the afternoon. I had to be packed away before 1.30 pm. Three months are allowed for a copy but the Louvre was closed to copyists for two weeks over Christmas, New Year. Were there many other copyists there? There were several other copyists, near me there was one doing a very bright version of a Fragonard and another beginning a vast multi-figure composition by Greuze. I left before the painter had made much progress and I think it would have been very hard to get it done. Is there camaraderie, or do you all guard your work jealously? There was a bit of conversation in bad French and bad English — I always try to speak French. One of the other painters was struggling a bit with the work so we had some chats about technique. There was an atmosphere of getting on with it as time is short. We all just drifted off in our separate bubbles of activity and I felt it was a nice atmosphere. Did you have to wear or carry anything in particular? No, I just wore my normal clothes as I do in my studio. Did the public interact with you — in a good, or not so good way? Yes, generally good. OK, some people have zero sense of personal space and would stand right up WAY TOO close or in front of me etc. Mostly people were interested and positive — I had a young Brit fashion guy with a baby on his arm asking a thousand questions — he wanted to do what I was doing. By far the biggest danger are people texting on phones who don’t look up while walking. How quickly did you work? On the first day I went at putting down a drawing on the blank canvas and it went OK and I looked at my watch and I still had an hour. So I thought right I’ll just put down the first coat of colour and so I did. At the end of the session one of the other copyists came up and said ‘Monsieur you are so quick!’ Er, yes I think I’ve developed a lot of knowledge about paint and technique and how it works –so it was a fairly good pace. At the end it was twelve sessions, some short, but I think it went well. Do Louvre authorities look at your work? Well, yes just to check at start and end — it’s not really their job to like it or critique it. I got a lot of unofficial comment from the guards who said hilarious things like –“I prefer your version” !!! What did you learn about the museum working in it compared to your previous visits? It’s a big family, a big organic creature with a lot of people interacting at many levels. I felt part of this organism, this ecosystem, and it made me love the place even more. I also discovered that it was Chardin himself that set up and formalised the system of copying paintings in the Louvre. Establishing that there will be no more than 90 easels available. Since then each copy is assigned a number and entered into the official registry — so it’s quite something to be in that book. What did you discover about the work and the artist by copying him? I discovered that Chardin certainly had limitations, he wasn’t some perfect draughtsman or born colourist. He had to keep at things and win them over, he had to find ways that his touch and sensibility could remake his perceptions, his emotions. He had to make the most of what he had. The painting is actually a record of these attempts and is a little wonky and asymmetrical but wonderful because of it. Its no wonder to me that he is the inspiration for so many artists — Cézanne and Matisse amongst them. There’s a story that Matisse tried to copy a Chardin in the Louvre and tried everything but couldn’t do it and it drove him crazy! Is copying Old Masters important for an artist of any stripe? What will you do with the work? Hang it, let it settle down and get on with life and then look at it. Well, it was the most committed copy I’ve yet made and it told me a lot of things I was curious about and it was a great experience, yes I’m very happy with it. Would you copy there again or would you like to try another institution next time? I would definitely love to make a copy or two more at the Louvre, and yes anytime it was possible I would whip into the Met or the Prado to make a copy! There are certainly some things I’d love to understand better about the great paintings! While you were in Paris you filmed more scenes for your movie The Big Kitty. What were they, and did they have to be done in Paris? Lisa and I really wanted to get our friend Jean into the film. As you know one of the rules of our film is everyone has to be a Melbourne artist to be in it. Jean has visited Melbourne several times, he’s an artist and he even dated a Melbourne girl. That qualifies him in my book, so we decided to shoot a little stairwell scene because our building had a wonderful, very noir looking stairwell. I cooked up a little scene and we shot it one very chilly night. When will the film be finished ? We’re in post- production phase — so I’m fixing up wobbly camera moves and doing some special effects stuff. We’re hoping for a release date in the middle of the year. In the meantime we’ll be releasing some promotional stuff and starting some publicity. Congratulations, Tom. Well done. Following your career with interest. I still enjoy the painting I bought from your first exhibition, in Perth. As an art student in London in the 60s I made a copy of Holman Hunt’s “The Hireling Shepherd”. It, too, was a labour of love.